Hidden object games have been childhood favorites for decades, with many parents nostalgic for the early versions in Highlights Magazine and the Where's Waldo books. This well-liked game genre has evolved to be more appealing to the online generation with a straightforward point-and-click interface, all while still offering the same sense of fun and discovery. Printable versions are available as well. No matter which option you prefer, you have plenty of choices. Many websites offer hidden objects games to play at no cost. The free versions are played online, directly from your web browser with no download required. Some sites also have downloads available, but those are fee-based (though some offer a free trial). The level of difficulty varies from title to title, but the actual gameplay mechanics will be very similar and easy to pick up- just point and click. The majority of games will be family friendly, though parents are advised to be vigilant about the age appropriateness of each specific game that their children play. The Hidden Object Games website offers a broad selection of hidden objects games for you to try. Clicking on the "Online Games" link in the navigation bar, you will be presented with a list of games that can be played within a web browser. Each of these games takes a few seconds to load before a large "Play" button appears. One shortcoming is that your game progress cannot be saved in the browser-based versions of the games. For a more complete experience, you may optionally download the full game to your computer - but this option is not free. You'll get the complete version of the game, but you are limited to a one-hour free trial. No credit card information is required. After that, you will need to purchase the game in order to continue playing. When you do, you unlock better graphics and more levels as well. 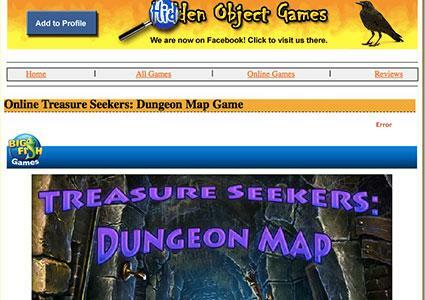 Some of the more notable titles on the site include Treasure Seekers: Dungeon Map, Twisted Lands: Shadow Town, Bewitched Doll: Horrible House and Family Relic: Lost Key. Ozzoom provides a good selection of games, some of which can be played free online without the need for a local download. The online games section has category listings for arcade and action games, as well as puzzle games and card and board games, but there is no separate section for online hidden object games. Instead, they are included as part of the puzzle game category. One example is The Mystery of the Crystal Portal. The site does have another section dedicated to hidden object games, but the vast majority of these are free trial downloads. The game can be played for free for up to one hour before a purchase is required to continue playing and to unlock more levels. This section does have over 1,000 titles available, giving you the chance to play quite the variety of seek and find games before you have to pay. The level of difficulty will be equally as broad, appealing to gamers young and old, novice and experienced alike. Popular titles on Ozzoom Games include Witches' Legacy: Hunter and the Hunted, Mystery Case Files: Fate's Carnival, and Haunted Halls: Nightmare Dwellers. In addition to offering a number of hidden objects games to play for free, Hidden247 also has categories for point and click, spot the difference, hidden numbers and hidden alphabet games. This gives a good deal of variety, while still utilizing a simple, straightforward interface. Many of the games have great stories to tell. Some of the games on Hidden247 include Elven Woods, Messy Hotel Room and Dakota Winchester's Adventures. The sites below don't offer unlimited free play, but the free trials can offer hours of no-cost entertainment. Gator Gamez presents a great number of hidden object games with a good selection of subject matter, including the gold rush, a haunted mansion and vampires. The free trials of the games can be easily downloaded from the website and do not require any personal information to get started. After the free trial is concluded, you will need to buy the full version to continue. Alternatively, you can buy the full version right away to get the complete experience with all the levels unlocked. Most of the game pages will include a description of what you can expect in the title and some pages also have a fuller review of the game to better guide your buying decisions. Many titles are also available for the Mac, in addition to the regular Windows PC download. Some notable titles in the genre include Golden Trails, The New Golden Rush, Haunted Legends The Queen of Spades, Stray Souls Dollhouse Story, and Sherlock Holmes and the Hound of the Baskervilles. Big Fish Games is not only one of the largest publishers of casual games across a huge range of genres and platforms, the site also offers many hidden objects games right from its own website. They are ranked by popularity, making it easier to select some of the best titles that are currently available. Many of the titles come in standard versions and collector's editions, the latter of which may come with extra bonus games, side missions, multimedia downloads like wallpapers and screensavers, strategy guides and other bonuses. Customer reviews are listed for each title, including an overall star rating, a review write-up, and individual ratings for fun factor, visual and sound quality, level of challenge and storyline. Members of the Big Fish community can list their skill level, so reading a corresponding review regarding difficulty will be more relevant. The free trials do not require any customer information, but a purchase is needed to unlock all the content. The games can be purchased individually or as part of the Big Fish Game Club. This provides "instant savings of 30-70% or more on every game," as well as a punch card for free games, and daily deal games for $2.99 each. New members can sign up for the Big Fish Game Club and get the first month free. The regular membership fee is $7.14 per month. Some of the more popular hidden objects games from Big Fish Games are Amaranthine Voyage: The Living Mountain, Myths of the World: Spirit Wolf and Haunted Train: Spirits of Charon. Not all no-cost hidden objects games require a computer or Internet access. The printable hidden objects games below are fun reminders of the days when these types of games would be featured in children's magazines and books, allowing children today to go offline with a paper and pen. To download, simply click the image of your choice; the printable game will open in a separate tab as a PDF file. All you need to do is print and enjoy! 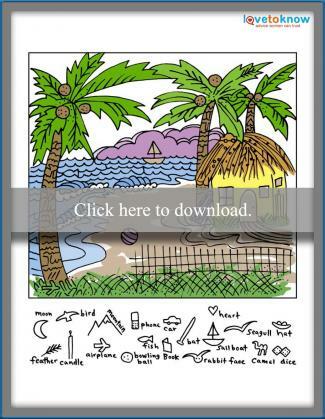 Download this beach theme game. 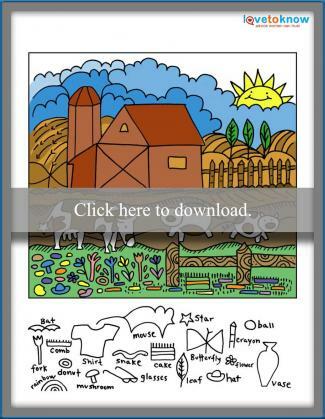 Download this farm theme game. Hidden object games are one of the most popular genres of casual games today. They can also be very educational. Teachers can use these games as tools to help students learn the English language, improve their searching ability, and learn more about historical events and geographical locations. Identifying the objects is great and developing vocabulary is even better.